David Rainbow’s PhD thesis looks at the Siberian regionalist movement, oblastnichestvo, from its inception, in the late-1850s, until the early-1920s. It represents a considerable advancement in English-language historiography on Siberian regionalism. While a number of works have been written on oblastnichestvo (N.G.O. Pereira, Jonathan Smele, Stephen Watrous), Rainbow’s is the first English-language treatment of the movement throughout the entire period of its existence in Russia. It is based on a broad primary source base, including archival research conducted in St. Petersburg, Omsk, and Irkutsk, contemporary regionalist newspapers and journals from the period in question, and published primary collections. It will be of great interest not just to specialists on Siberia, but also historians of Russia more generally. The thesis develops several broad conceptual themes to address its main topic, which are elaborated and investigated in five chapters. These themes include “Siberian patriotism”, “participatory autocracy”, and “imperial cohesion”. “Siberian patriotism” is Rainbow’s preferred term for regionalist politics and regionalists are generally referred to throughout the thesis as “Siberian patriots”. In the thesis introduction, a pointed distinction is drawn between patriotism and nationalism or separatism (p. 27): indeed, except for a brief period in the 1850s and 1860s, Siberian patriots did not seek to separate Siberia from the Russian Empire. As a political movement, they professed love for Siberia whilst nevertheless viewing it as part of a wider Russian body. They aimed, at least in the immediate term, at “progress” to make Siberia more modern, educated, and “cultured” in order to provide the basis both for its own autonomy and a wider transformation of Russian politics and society. Rainbow’s second conceptual theme, “participatory autocracy”, describes the mode of political rule in the Russian Empire during this time. The author argues that the imperial state drew its population into active roles as participants in government in order to achieve its own political aims. This, he is careful to note, was not the same as “popular government”: the Tsar ultimately retained sovereignty (p. 3). However, it did mean that social actors were able to influence the Imperial Russian state and its processes of government. This approach adds to recent literature on the state in Russia and the Soviet Union, in which scholars have highlighted the extent to which state processes relied upon the active involvement of its citizens in order to function (Yanni Kotsonis). A third theme developed in the thesis is that of “imperial cohesion”, which is used to consider both the position and role of Siberia, ostensibly an imperial periphery, in the maintenance of a viable, stable imperial state. As Rainbow notes, state officials feared the breakaway of Siberia and were thus ever-wary of regionalist ideas. Nevertheless, they worked willingly with Siberians, including patriots, in order to pursue common aims and agendas. These aims and agendas included increasing popular education, cultural development, and administrative control in the region. Chapter 1 details the formative period of Siberian patriotism, spanning the late-1850s until the 1870s. Rainbow traces the ideological genesis of the patriotic movement through the experiences of several young Siberian intellectuals, in the process offering both an extremely detailed and very readable analysis. Different ideological strands of early Siberian patriotic thought are highlighted. Young Siberian intellectuals, who would provide the movement’s leadership in future decades, drew their ideas from studying in major Russian universities, particularly in St. Petersburg, where they encountered Ukrainian regionalist academic, Kostomarov. They were also influenced by prominent oppositional intellectuals, including individuals in Siberian exile, such as Herzen and Kropotkin, who advocated federal government. These ideological influences help account for the subsequent intellectual biases of Siberian patriots, particularly their emphasis on “progress” as a precondition for regional autonomy. At the same time, patriots’ ideas of decentralised rule were spurred by growing nationalist movements in the Russian Empire. The Polish uprising of 1863, in particular, gave a distinctly separatist tinge to Siberian patriotic publications produced in the same year. The patriots’ early activities quickly landed them in hot water. Following the uncovering of separatist patriotic proclamations, key members of the budding intellectual movement were arrested. The arrests are detailed in the published collection of primary documents, Delo ob otdelenii Sibiri ot Rossii, which provide the basis for much of Rainbow’s discussion in the chapter. He argues that the arrests were not just a sign of state officials’ hostility and fears towards the patriots; they also helped reveal a degree of common ground between the two. During questioning, patriots were asked to highlight ways they thought the condition of Siberia could be improved. They gave lengthy answers which were carefully recorded by interrogators. This is cited convincingly as evidence that both state officials and patriots were willing to see one another as potential partners in constructing a new future for Siberia. Following lengthy periods in prison and exile (patriots were exiled away from Siberia for their political activities), patriots returned to the region in the mid-1870s. Several took the opportunity to engage local state officials in their visions for achieving “progress” in Siberia, most notably Iadrintsev, who gained the patronage of the governor of Omsk for his proposals to establish a Siberian university. Chapter 2 focusses on statistical studies in Siberia during the mid-nineteenth through to the early-twentieth centuries. These studies fulfilled the immediate goals of both state officials and Siberian patriots and are highlighted as a further point of cooperation between the two. On the one hand, the Imperial regime was becoming increasingly concerned with gathering accurate information on the populations and resources of its various regions, as the basis for effective “statecraft”. On the other, patriots believed that greater and more accurate knowledge of Siberia would support their case for reform and, ultimately, self-government. From the 1860s onwards, Siberian patriots were involved in various official and semi-official initiatives alongside Imperial officials. Rainbow focusses on two in particular: the Imperial Russian Geographic Society (IRGO) and the Omsk census of 1877. The IRGO was established to investigate local conditions across the Russian Empire. In Siberia, patriots helped form IRGO branches in Irkutsk and Omsk and sought to use the Society’s research as a means to investigate Siberian conditions and raise awareness amongst Siberians of the need for regional reform. The Omsk census of 1877, meanwhile, provides a particularly interesting point of discussion. It was an impressive feat of governmental organisation in the Russian provinces, being conducted less than a decade after the first major census in St. Petersburg. The census also highlighted the growing interconnectedness of state and social actors during the late-Imperial period, thus providing clear evidence for the idea of an emerging “participatory autocracy”. Like to IRGO, the census gained active patriot support; it also involved different groups of the local population, which was asked to take an active role in its own documentation. While chapter 2 considers patriots’ engagement in ostensibly “state” initiatives, chapter 3 highlights the extent to which Imperial state officials engaged and supported the projects of patriots. It focusses on print media, a particularly useful point of reference for unpicking the wider question of how state and society related to one another. On the one hand, the growth of newspaper and journal publications in the late-Imperial period provides evidence of “society” organising on its own initiative, according to its own concerns. On the other, it also provides evidence for the ways that the state became involved in the affairs of its citizens. Imperial state officials served as censors, overseers, and often also patrons of Russia’s growing press. This, Rainbow notes, is not simply a sign of the state’s determination to crush or control society, but also that officials saw ostensibly non-state actors as potentially valuable partners for achieving the regime’s own aims and objectives. Siberian patriots helped set up and bolster Siberia’s press from the 1860s onwards. The thesis focusses on several publications during this period, including Sibir’, Amur, Sibirskie vedomosti, and Vostochnoe obozrenie. Utilising both archival documents and the publications themselves, Rainbow traces the intentions of Siberian patriots for the press. Again, he argues, the idea of “progress” was key: print media was seen as a means to inform and educate Siberians, thus encouraging greater involvement in the region’s affairs and, with it, greater regional identity and pride. The complex involvement of state officials was also critical to the development of the press, however. Censorship, which was often hampered by the state’s limited resources, was rather ineffective in the Siberian case. However, state officials often acted as patrons to Siberia’s newspapers and journals, thus playing a positive role in their development. Focus is given to the role of governor-general of Eastern Siberia, Murav’ev-Amurskii, who was an active supporter of the publication, Amur. What becomes clear is that the character of the relationship between the press and state often depended on the different personalities involved, something highlighted by the case of Murav’ev-Amurskii, who was able to develop collegial relations with some Siberian patriots. However, Rainbow reminds us, all this also meant that the press was becoming an integral component of emerging participatory governing practices in Siberia and the Russian Empire more generally. Chapter 4 again returns to the issue of patriotic ideology during this period, focussing on the concepts of race and ethnicity in Siberian patriots’ thinking. The concepts of ethnicity and, particularly, race, Rainbow argues, have often been neglected by historians of Russia and are negatively associated by some historians with destructive twentieth-century European racial politics (pp. 288-291). Nonetheless, he suggests they can provide a useful angle for considering patriotic concepts of Siberian identity. The chapter first charts the growing importance of concepts of the nation in Siberia. From the 1860s onwards, some Siberian patriots began talking of Siberia in terms of nationality. At this early stage, little emphasis was placed on ethnicity as the basis for a potential Siberian nation. Rather, attention focussed on Siberia’s distinctive geography and experience of neglect and exploitation by the Imperial Russian state. Following the short-lived separatist phase of Siberian patriotism, however, some patriots did begin thinking in terms of ethnicity, most notably Iadrintsev. Iadrintsev suggested ethnic mixing between Russian settlers and indigenous Siberian populations was resulting in new Siberian “mestizos”. Initially, this mixing was used to explain Siberia’s manifold problems. Indigenous Siberians, it was suggested, were dragging down Russian settlers to their level, preventing them from progressing socially, culturally, and politically. Later, however, the results of ethnic mixing were seen as more positive, even providing the basis of a new Siberian nationality, imbued with the distinctive and positive characteristics of independent-mindedness, self-confidence, and pride. These, it was suggested, might provide the basis for successful autonomous self-rule in Siberia. Ethnicity and race provide an intriguing new angle to research on Siberian regionalism. They also raise a broader point about how these concepts can be seen in Russian history. Rainbow argues that historians should not shy away from these tricky, often loaded concepts; they should not see them as simply dangerous or divisive. Instead, in the case of Siberian patriots, the idea of race provided a conceptual means to unite the ethnically-diverse Siberian population. This is a point well made, and well taken. The final chapter, chapter 5, offers some of the most surprising and interesting findings of the thesis. The chapter considers the changing political views and strategies of Siberian patriots during the revolution of 1917 and subsequent civil war. It puts forward the bold argument that patriots invested their efforts not towards breaking away from the stricken and fragmented Imperial state, but towards combatting what they saw as the dangerous centrifugal forces tearing it asunder. This, Rainbow concludes, ultimately undermined patriots’ longer-term ambitions for Siberian autonomy. He demonstrates patriots’ increasingly centralising convictions, particularly through their support for successive anti-Bolshevik governments operating in Siberia during the civil war: the Provisional Siberian Government, the All-Russian Provisional Government, and the government of Admiral Kolchak. These different governments claimed to be fighting to reconstitute the Russian state against reckless Bolshevik rule. Patriots’ involvement in their work, though often controversial, was thus a logical extension of their well-established belief that Siberian autonomy must be built on a strong, coherent Russian state. As before, under the Imperial regime, this provided the basis for ideological agreement between the conservative Russian right and reformist Siberian patriots. Rainbow’s argument may be deceptive in its simplicity: in fact, it offers an extremely bold and important reinterpretation of the role of Siberian regionalists in revolution and civil war. Following the civil war, the claim was made by some émigré regionalists (I.I. Serebrennikov) that regionalists represented the true, if not the only, voice for political decentralisation in Siberia, and were forced to combat the centralising visions of almost all other political groups in the region during the revolution and civil war. This argument has subsequently been adopted by several Western historians of Siberia (N.G.O. Pereira, Scott Smith, Jonathan Smele). By contrast, Rainbow’s research suggests regionalists were far more willing to accept centralised state authority, especially while they perceived a threat to the Russian state as a whole. This threw them into a camp with groups which had little or no ideological interest in Siberian autonomy themselves and, in the process, hamstrung Siberian patriots by preventing them from effectively pursuing their aims for regional autonomy during this period. Overall, David Rainbow’s thesis provides an extremely valuable and highly readable reconsideration of Siberian patriotism, from its inception in the 1850s up to its collapse (at least in Russia) in the 1920s. It is broad in scope and carries enormous detail, evidence of the author’s meticulous primary research. It also addresses important questions with application not just to Siberia, but also to the Russian Empire more generally. In short, it is much more than a dissertation on Siberian regionalism. Rainbow has given insight into wider questions of the Russian state and its interactions with its citizens during this period. He also tackles the complex and often seemingly contradictory ideological developments of Siberian patriotism with admirable clarity and lucidity. This thesis will soon provide the basis for Rainbow’s first book. When it appears, it is sure to become an important revisionist contribution to the study of both Siberian regionalism and the Imperial Russian state. New York University. 2013. 420 pp. Primary Advisor: Yanni Kotsonis. 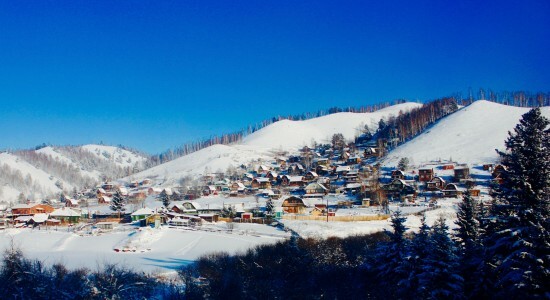 Image: View from the the Trans-Siberian railroad. Photo by author.